I was looking for a place large enough for me and 18 of my friends and I found Coral Gardens Villa. I wanted somewhere that I would be proud to bring my friends and show off the beauty of my hometown and enjoy carnival 2016. When I say that this villa checked off all of my boxes in a place away from home. It had scenic views, perfect location, Immaculate decorations, tranquil atmosphere, beautiful breathtaking picture perfect views, spacious rooms, beautiful sunsets, and the list goes on. Words can't describe the look in my friends eyes when they say this place it was priceless. To top it off the owner went above and beyond to make our stay memorable. In my words this Villa was, Fabulous, Breathtaking, Amazing, and Gorgeous. This will be our Villa of choice every time we come to St Thomas. Nothing is more Fabulous than this Villa in St Thomas, Virgin Island !!!!!!!!!! I have been planning my husband's 40th birthday with Werner & his team for about a year now. I do hope my words do justice in describing our stay at Coral Gardens Estate, since everything was beyond perfect! Both villas have breathtaking, heavenly views of Magens Bay, which was the perfect backdrop for all our events. We rented the entire property with a fully serviced option which included concierge, transportation, chefs, masseuse, baby sitters, party planners & more. I am so glad that we held our events here vs. a hotel, it helped us create the personalized experience we wished for all our guests. We had about 50 guests stay at this property, our age group spanned 2 to 75. Both villas are beautifully appointed with very comfortable & luxurious furniture. All bedrooms are equipped with heavenly mattresses, some rooms have cribs, pack n' plays, trundles, & high chairs are also available. The villas also have a gaming closet fully outfitted with several board games, & the family room TV is hooked to the Wii, & XBOX with every game imaginable. All the kids in our group were entertained at all times, by all the games, or jumping into one of the 3 magnificent pools, which are also equipped with noodles, snorkeling gear, & lounging chairs. Food & Wine was a very big component of our celebration! Werner's team ensured the villa was very well stocked with all our food requirements, & an amazing selection of wines. The in-house chef cooked up several delightful meals, ranging from Caribbean, Mexican, Italian to Indian. The kitchens are very well stocked with everything you need to cook a great meal, but the best part was being able to seat 50 people for dinner together every night, watching an amazing sunset and sipping delicious wine! It's heaven! The villa is located in Peterborg Estate which is about 15 minutes away from downtown, & 5 mins from Magen's Bay - one of the best beaches! I believe our time in St. Thomas at the Coral Gardens Estate was truly blessed from the start, the weather was beautiful everyday, all our guests had an extravagant vacation, and all our events which ranged from a formal night with DJ & entertainment, several family style meals, beer pong tournaments, to BVI excursions on Triple Smooth were all spectacular. We couldn't ask for a more perfect vacation and birthday celebration. It was just extraordinaire! My husband and I rented both villas for a week to host a group of friends to celebrate my 60th birthday. We have used VRBO in the past, always with good luck, but never such a large property for such a large group. I was nervous about the investment, especially with no real "contract" until we arrived in St. Thomas and were met by Americus who led us from the airport to this amazing property. Americus arranged transportation for our entire group on several occasions even though we had 4 rental cars in our group; we were very appreciative of his driving skills! Every one of the bedrooms, except one, had an en suite bath and that bedroom had a full bath right outside the door. The bedrooms were all well appointed although they did not all have TVs in the room, which may be important for groups with kids. The common areas were outstanding, from the large living/dining area where we were all able to eat meals (some prepared by fabulous chefs) to the large kitchen where we were able to make meals together. Werner and his staff bent over backwards to arrange all of the activities we wanted to do while in St. Thomas. They arranged charters for a sunset dinner cruise and an all-day sail to Virgin Gorda with a stop at Soggy Dollar Bar, golfing, zip lining and parasailing. After seeing some of the "Safari tours" driving around the island, we asked if we could arrange a half day bar-hopping/sightseeing tour and 2 days later Werner and Americus had it arranged. Some of our group participated in lots of extra activities during the week we were there, others spent their days lounging by the 3 pools at the villas. Our group included several very well traveled couples and every one felt that this trip was one of their best vacations. I can't say enough about everything Werner, Drew, Americus and Chef Spraga did to make this vacation a "trip of a lifetime" for my husband and me and our group of friends. I would not hesitate to recommend this villa if you need a nice place for a large group (or Secret Garden for a smaller group). You will not be disappointed! LAST DECEMBER (2015) WE TOOK A COMPANY RETREAT TO THIS INCREDIBLE PROPERTY. IT EXCEEDED EVERY EXPECTATION! THE MOST BEAUTIFUL VIEWS, 2 SWIMMING POOLS, AND AN INCREDIBLY MASSIVE YET VERY COMFORTABLE HOME. WERNER WAS A MOST GRACIOUS HOST, AND HELPED PLAN EVERY ASPECT OF THE TRIP. (HE EVEN PERSONALLY DROVE US TO TOWN ONE EVENING FOR DINING AND COCKTAILS) WE TOOK ADVANTAGE OF SEVERAL INCREDIBLE ACTIVITIES, INCLUDING: A PERSONAL CHEF FOR A BREAKFAST AND TWO DINNERS, A MASSEUSE WHO CAME TO THE VILLA, AND EVERYONE'S FAVORITE - A RIDE ON WERNER'S BOAT (THE TRIPLE SMOOTH) WE HAVE BEEN THROUGHOUT THE CARIBBEAN, AND HAVE NEVER SEEN ISLANDS AS BEAUTIFUL AS THE BRITISH VIRGIN ISLANDS THAT WE WERE ABLE TO EXPLORE. ABSOLUTELY STUNNING! I WOULD HIGHLY RECOMMEND THIS PROPERTY. We had a family reunion, total of 32 people, there was enough space for everybody to have their "personal time" and excellent common areas for the family to share. Excellent snorkeling in property small beach, close the Magen's Bay Beach, beautiful!. Would definitely go back. I recently rented Coral Gardens for myself and my stateside family for my wedding and had a wonderful time. The villa is spectacular with large bedrooms and bathrooms in most. A well maintained property with incredible views and you can’t beat the sound of the waves on the rocks below. The owner, Werner and his staff were fantastic and, while unobtrusive, were available for anything we needed at a moments notice. 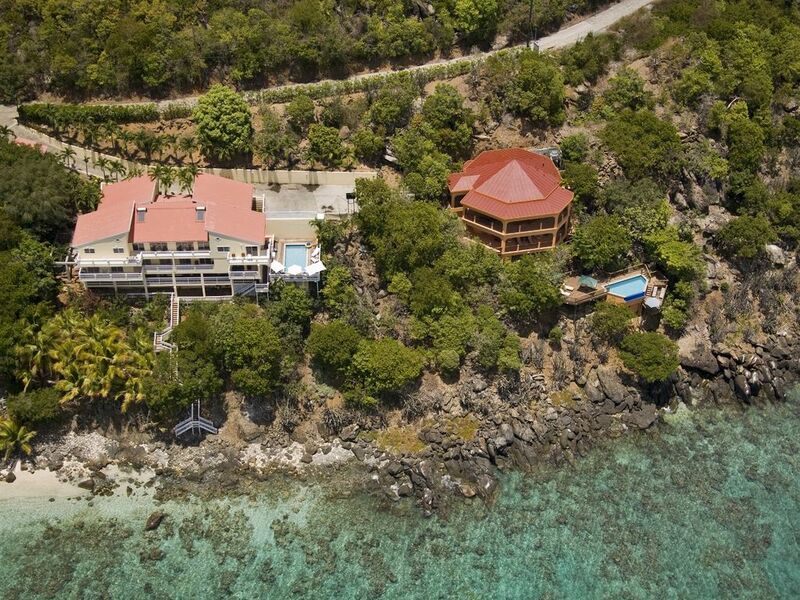 I have been a resident of St.Thomas for 8 years and know most of the properties on this island and Coral Gardens is hands down the best villa for the money. Thanks again Werner. You guys were great. Rates are subject to change until reservation is confirmed. No refund for cancellation, however, owner will offer same or similar days for cancellation or postponement. Please contact owner (Werner Scott) 214-500-7307. If you wish to book Coral & Secret Gardens together (max 50 guests) contact owner.